Neither an old royal garden (like the Tuileries or Luxembourg), nor a ”Haussmannian” park of the late 19th century (like Montsouris or Buttes-Chaumont), the Parc André Citroën in Paris belongs to the latest generation of the city’s parks, generally designed on a former industrial site that was redeveloped over the past decades (like Bercy, or La Villette). It owes its name to a former Citroen plant located here until 1982. A quick glimpse of the park does not show its originality. 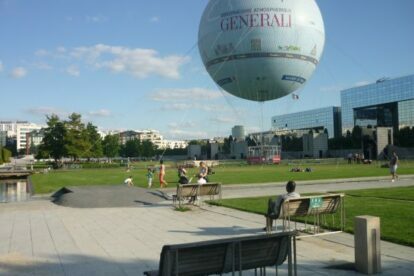 Besides the helium balloon (which offers a vertical 150 m rise for € 12), it just looks like an empty lawn where local families and groups of friends like to sunbathe, while kids play in the waterjets. But if you are curious, you’ll be rewarded: to the north of the main lawn, seven hidden manicured gardens – identified by the dominant colour of the flowers – offer an organized but still labyrinthine winding path over three different levels, like in a recreation of the French formal gardens of Le Nôtre. In the southwestern angle, the Garden of Metamorphoses (the landscape designers included many references to alchemy) is also a must-see, with its variety of plants and flowers in rectangular boxes. These gardens offer shady areas, with comfortable wooden body-shaped chairs, and even a very fresh sparkling water fountain near the Northwest entrance (near the Jardin Sauvage, the wildest grove of the whole park). Don’t miss the Black Garden either: following the great diagonal, this southeastern extension offers peaceful, isolated areas beneath the main level.